I would like to learn more about this 2011 Chevrolet Camaro LT. Please contact me as soon as possible! 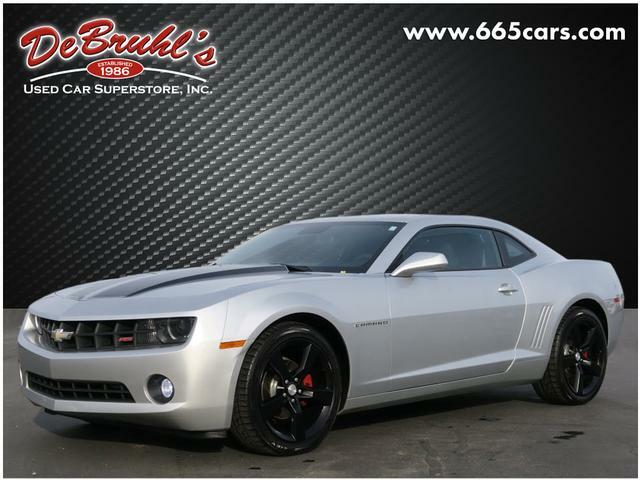 * TELESCOPING STEERING WHEEL * * 6 Cylinder engine * * GREAT DEAL AT $12,950 * * Check out this 2011 Chevrolet Camaro LT * * 2011 ** Chevrolet * * Camaro * This Silver Ice Metallic 2011 Chevrolet Camaro LT might be just the 2 dr coupe for you. It has a 6 Cylinder engine. Flaunting a beautiful silver exterior and a black interior, this car is a sight to see from the inside out. Fight against wind resistance with the rear spoiler. Interested? Dont let it slip away! Call today for a test drive. DeBruhls Used Car Superstore is the largest independent auto dealer in WNC! We offer a full range of financing with our guarantee credit approval, everyone is approved here.